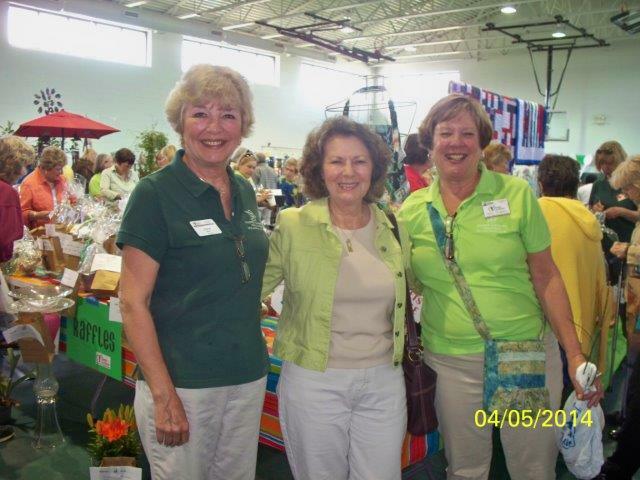 Master Gardeners Joyce Mazur, Angela Burkett (alum) and Nancy Dougherty enjoy their Albemarle Master Gardeners’ Garden Show. This year’s event will be held Saturday, April 28 at the Perquimans County Recreation Center. The Eighth Annual Albemarle Master Gardeners’ Spring Garden Show, “Through a Garden Gate,” will be held on Saturday, April 28, 2018, at the Perquimans County Recreational Center, 310 Granby Street, Hertford, from 9:00 a.m. – 3:00 p.m. This annual fundraising event to support the Master Gardeners’ scholarship fund will feature plant sales, gardening items plus locally made crafts from a variety of vendors, a children’s corner, “Ask a Master Gardener Booth,” homemade baked goods, educational speakers, 50/50 raffle drawing and more. Lunch will be available for purchase by Brew2Rescue Café and admission is free. This is the Master Gardeners’ only fundraiser for their scholarship, The Katherine G. Shook Master Gardener Scholarship, which is awarded each year to students from Gates, Perquimans or Chowan counties who are pursuing a career in agriculture, horticulture, natural resources or a related field. For more information, please contact Katy Shook, Extension Agent for Gates, Perquimans, and Chowan Counties at kgshook@ncsu.edu or call 252-482-6585. Visit their website at https://perquimans.ces.ncsu.edu/springgarden for additional information on vendors, exhibits, and speakers. This site includes directions to the event.